Twenty civil society organisations in Cambodia have called on the Mekong River Commission to delay a regional forum to discuss the building of the Pak Lay hydropower dam in Laos. 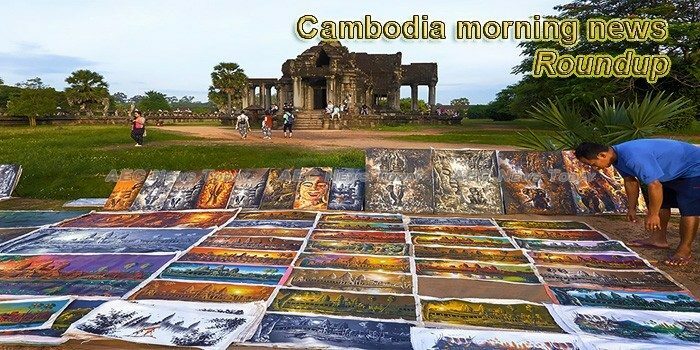 Almost 1.1 million Chinese tourists had visited Cambodia in the first seven months of 2018, up 72.6 percent over the same period last year, said Cambodian Tourism Ministry’s latest report released Monday. Nearly 100 students gathered at the Education Ministry yesterday to protest the results of the national exam, particularly their results in mathematics. A pilot project in Cambodia may help small-scale organic rice farmers get better deals for their produce. Using blockchain technology, the project connects a large network of people in the supply chain and hopes to ensure everyone gets a fair share of the deal made. The leader of Cambodia’s now dissolved opposition party was freed on highly restrictive bail Monday after being jailed for a year on a treason charge, the latest government opponent to be released since Prime Minister Hun Sen’s landslide election victory. Former opposition leader Kem Sokha was released on bail yesterday, but will enjoy limited freedom after the court restricted his movement to a four-block radius around his Phnom Penh home and banned him from meeting any ex-CNRP officials or individuals seemingly linked to his treason case. This year’s celebrations for United Nations Day will be held at the silk research centre of the Royal University of Phnom Penh, with an unnamed UN representative saying local silk is a symbol of innovation in tackling development goals, according to a university official. The Council for the Development of Cambodia (CDC) approved four new factories in Cambodia with a total investment of more than $22 million. On behalf of the Royal Government and the people of Cambodia, Prime Minister Hun Sen sent a letter of condolence to the president of Swiss Confederation, Alain Berset, expressing his deepest grief of the passing of Dr. Beat Richner, the founder of Kantha Bopha Hospitals in Cambodia, on 9 September 2018. China has awarded scholarship to 22 Cambodian students to study in Hainan province, the People’s Republic of China. His Majesty Norodom Sihamoni, King of Cambodia, and Her Majesty the Queen-Mother Norodom Monineath Sihanouk left here this morning for a routine medical checkup in China. Defending the fact that the leadership has remained largely the same in the sixth mandate of the government, Prime Minister Hun Sen said reforms were more about improving job efficiencies. Kong Vibol, director general of the General Department of Taxation, sat down with Khmer Times editors recently to discuss allegations of fraud and corruption levelled against him by Al Jazeera. Meetings being held at the Labour Ministry to discuss an increase in minimum wage for garment workers in 2019 have yet to yield results , but a figure is expected on Friday, an official said yesterday. Cambodia’s capital may be experiencing one of the world’s fastest property booms — thanks to Chinese builders and buyers.